It isn't as well-remembered as it should be that World War II began with the invasion of Poland by Germany and Russia. In 1939, the two predatory, totalitarian nations, with much shaking of hands, toasts, and lizard smiles, concluded the Molotov-Ribbentrop Pact, a non-aggression agreement that they proclaimed would help insure world peace. It was a shocking development in international affairs, for the world had come to view the two tyrannies as the embodiments of antagonistic and irreconcilable political philosophies, Fascism and Communism. Their respective dictators, Hitler and Stalin, were ruthless men, however, willing to sacrifice millions to elevate themselves and only their fanatical followers should have been so naïve as to expect them to let ideology prevent them from reaching an agreement that served their interests. During World War I, Germany had been strained by fighting France and Britain in the West and Czarist Russia in the East. Many hoped that the possibility of a second two-front war would deter Hitler from risking a new war in Europe. The Pact removed this check. It made it possible for Hitler to confront France and Britain, who had promised to support Poland, without the annoyance of a belligerent Russia. The pact also included a war plan so secret that the Soviets denied it existed until 1988 and no copy of it was made public until after the fall of the Soviet Union. In the secret plan, Stalin and Hitler agreed to divide control of the nations lying between Russia and Germany. Russia was given Finland, Estonia, Latvia, and half of Poland. Germany got Lithuania and the other half of Poland. Poland would be the first nation taken with Russian and German armies attacking in coordination. Stalin liked the deal not only for the territorial concessions - Russia had lusted after the Baltic states and Poland for generations - but because it positioned Russia to exploit the European war that was likely to erupt following Poland's invasion. If Hitler kept his word and attacked only to his west, Russia could just watch while France, Britain and Germany tore each other apart then swoop in to take advantage of the chaos and ruin. The West would be unlikely to declare war on Russia. They'd have enough on their plate just dealing with Germany. If Hitler broke his word and attacked Russia, Stalin could expect France and Britain, who would already be fighting Hitler, to be his allies against Germany. In the meantime, Soviet Russia would co-operate with Germany and expand its territories, creating a buffer zone between it and Germany where an invasion could be turned back before reaching Russian soil. The Molotov-Ribbentrop Pact worked as Stalin expected - at first. Hitler invaded Poland on 1 September 1939, causing France and Britain to declare war on Germany. A short delay had the advantage of letting Germany do the bulk of the fighting to destroy Poland's military. 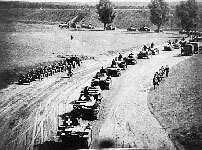 When Soviet Russia attacked on 17 September there were only lightly armed Polish border guards left on Poland's Eastern border to face the Red Army's heavily-armed millions (at the end of the war, the Soviets pulled a similar stunt by declaring war on Japan just days before it surrendered to the Allies). By the time the fighting stopped, the Soviet Union had taken over 280,000 Polish soldiers as prisoners. They also arrested intellectuals and professionals, who might resist Russian occupation. Thousands of these soldiers and potential troublemakers were quickly executed. German and Soviet troops together staged a victory parade to celebrate the destruction of Poland. The two nations issued a joint declaration calling upon Britain and France to end the war and hinted that, if they didn't, Germany and Russia would "engage in mutual consultations" that might bring Russia into the war on Germany's side. Communist parties around the world, following Soviet dictates, adopted an "anti-war" stance that blamed France and Britain for the war. Soviet Russia even sold Germany resources important to its war effort. Stalin became so confident of his arrangement with Hitler that when Germany attacked Russia in 1941, he refused to believe it until thousands of his soldiers were dead and the German army was deep inside Russian territory. Before Hitler turned on Stalin, the Soviet Union staked its claim to the countries that the Pact had given to them. Estonia was occupied by the Soviet Union in 1940. The Soviets used the same tactics in Estonia as they had in Poland, rounding up military men and intellectuals. Thousands were executed or deported to Siberia. Political freedoms were eliminated and an elaborate and continual indoctrination campaign was launched to convince the Estonian people that Communism was the bee's knees. To a degree, these tactics succeeded. A defenceless, captive people threatened with prison camps and firing squads will do as they're told but, along with obedience, Soviet repression produced a smouldering hatred. This deepened after Germany went to war against Soviet Russia and the Soviets forced thousands of Estonian men to fight for them against Hitler. The Red Army was quickly pushed back by the Germans, who occupied Estonia. It has been charged that, as they fled, the Soviets executed Estonian political prisoners rather than release them. The prisons in Estonia didn't stay empty for long. The Nazis soon were rounding up their enemies among the Estonians and jailing them. Like some bizarre TV ad comparing Brand X to Brand Y, Estonians, who had endured one kind of tyranny, were now trying out another. In this case, both were horrific but, when the Red Army was on the verge of returning, some Estonians enlisted in the German army to fight the Russians. The Germans were soon driven out and thousands of Estonians fled their country to avoid a new Soviet occupation. Small bands of Estonian soldiers, called the "forest brothers," fought a guerrilla war against the Red Army but, lacking support from outside Estonia, by 1950, they were all in hiding, captured, or dead. The Soviet reoccupation of Estonia was brutal. This time, they had a grudge to settle with the Estonians, who they viewed as Nazi collaborators. They ruthlessly instituted strict measures to Sovietize the country. Since Communism is an inherently flawed form of government, these measures inevitably produced poor results, but, instead of blaming their ideology, the Communists blamed their victims. A terrible example of this occurred when the collectivization of Estonian agriculture stalled. The Russians rounded up 20,000 Estonia farm families and shipped them off to work camps in Siberia where half are said to have died of starvation and disease. The survivors were only allowed to straggle home in the 1960s. By then, to ensure loyalty, the Soviets had settled thousands of Russian families in Estonia. These were often the families of veterans or of Communist bureaucrats selected for their loyalty to Communism. They were placed at the top of Estonia's establishment with lots of despised Estonians to boss around. By the time the Soviets were done shipping Estonians out and Russians in, Estonia's population was one-third Russian. The Russian language and Russian culture were forced upon Estonia. On top of this, Soviet military bases were planted across the country to control the locals and project Soviet power against the West. Much of its seacoast, for example, was set aside for the use of the Soviet Baltic Fleet. As they did in every state in which they gained control after the war, the Soviets self-righteously insisted they had "liberated" Estonia from Germany and had bestowed upon it the blessing of Communism. They demanded gratitude. Russia's insistence on gratitude wasn't an accidental thing. It was an offshoot of the propaganda that Stalin used to rally Russia against Germany. He had killed millions of his own people and feared the invading Germans might be welcomed as liberators. To counter this, he appealed to Russian xenophobia, nationalism, and, with a large degree of cynicism for an atheistic society, religious imagery. Russia was the sacred Motherland. Her soldiers were heroic warriors engaged in a holy crusade. Russian war dead - 23.5 million by the end of the war - sanctified Communism with their blood (critics counter that the high casualties were the result of Stalin's inept military leadership and wonder if he'd been more inept, would Communism be more sanctified?). Even the war had a special, Russo-centric name. In exploitation of an earlier national triumph, the Patriotic War against Napoleon in 1812, World War II was called the Great Patriotic War. The contribution of other nations, including the massive aid sent to Russia by the USA, was minimised. This kind of propaganda continued after the Germans were defeated to generate more patriotic fervour for the new Cold War. The rest of the world, which had suffered fewer deaths, owed Russia for its sacrifices. The territories caged in by the Iron Curtain were well-deserved tribute. The soldiers of the Great Patriotic War were lauded as patriots who defended Communism, thereby elevating it above questioning. And war memorials glorifying battles and soldiers were erected everywhere to insistently remind Russians of the costly effort to preserve the Soviet state. Outside Russia, they were erected as a reminder of Russian dominance and as a blunt demand that Russia be honoured for fighting a war they helped start. To the citizens of the subjugated states, the monuments became detested symbols of tyranny. So it was with the "Bronze Soldier" memorial in Tallinn, Estonia. In the late 1980s, as Soviet Russia began to crumble, nationalists in the countries forced into Communism began to demand their freedom. The 1956 Hungarian Revolution and the Prague Spring of 1968, both of which were brutally thwarted by Russian troops and their allies, vividly illustrated the dangers that the nationalists risked. None were able to militarily confront their occupiers. Instead, they used strikes, demonstrations, and appeals to international opinion to advance their cause. In Estonia, a unique form of revolution won Estonians their freedom. It was called "The Singing Revolution." Estonians have traditionally enjoyed music festivals, which include choral singing with audience participation. The Soviets banned songs with nationalist associations but even non-political songs provided an opportunity for Estonians to share a feeling of group identity. Beginning in 1987, nationalists began to introduce traditional songs. Estonians, eager to defy the Soviets, sang along in greater and greater numbers. It wasn't long before mass singing demonstrations with as many as 300,000 singers became a common event. Pro-Soviet demonstrators attempted to intimidate the nationalists but were thwarted when greater numbers of nationalists turned out to peacefully face them down. By the time the Soviets sent in troops, they were blocked by thousands of ordinary, unarmed Estonians standing as human shields. In 1991, the Estonian Supreme Soviet and the Congress of Estonia proclaimed independence. At the same time, the Soviet Union was breaking up and Estonian independence became a fact. Without firing a shot, Estonians had won their nation's freedom. Text copyright © Frontpage Magazine.com. No breach of copyright is intended or inferred.